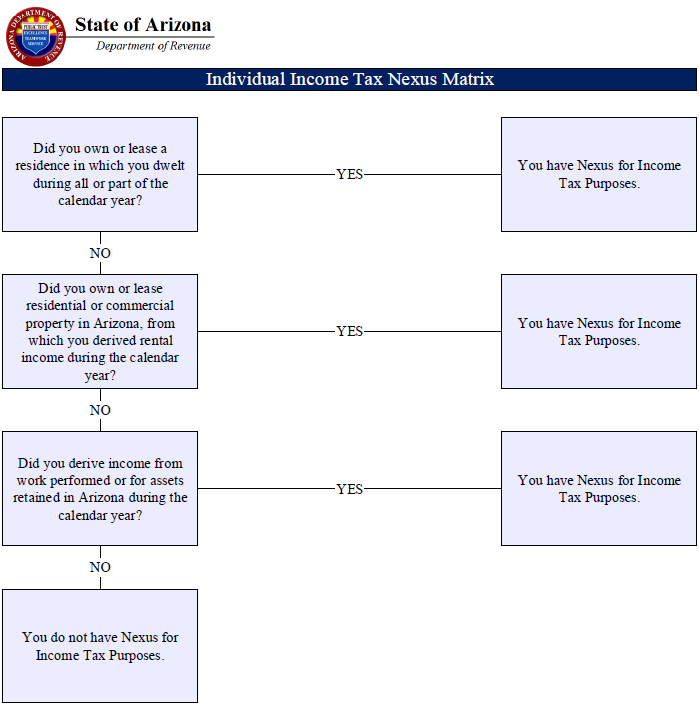 Nexus is the connection required to exist between a state and an out-of-state potential taxpayer where the state has the constitutional right to impose a tax. The United States Constitution limits the states’ right to tax through the Due Process Clause and Commerce Clause. However, each clause has a different requirement or threshold that must be met before a state may impose a tax collection or payment responsibility on an out-of-state taxpayer. For example, the Due Process Clause requires requires a definite link, a minimum connection between a state and the person, property or transaction it seeks to tax. The most minimal connections will satisfy this requirement and does not require a physical presence in the state. Due Process also requires the income attributed to the state for tax purposes must be nationally related to values connected with the taxing state. This last requirement is rarely a bar to tax enforcement. View Publication 623 for more information. There are many factors that determine whether nexus exisits for individual income tax purposes. For example, residency, ownership or lease of real property that produced income, and work performed in Arizona during the tax year that produced income.